Book an Air New Zealand return fare to Auckland, then catch domestic flights around the country. 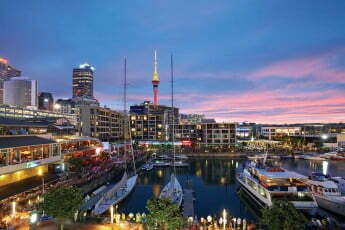 Fly into Auckland, an energetic, multi-cultural city that's framed by harbours and dotted with ancient volcanic cones. Auckland is the fast-beating heart of a beautiful region that's full of things to see and do. Best of all, you easily can hop from one adventure to the next without having to travel too far. Auckland is great to experience on foot. Stroll the Viaduct Harbour, enjoy a café lunch in the hip Britomart precinct or pick from a choice of escorted tours. You should also check out the views from the iconic Sky Tower or walk around the tower from the outside - 192 metres above ground! If there's time for more thrills, head to the Auckland Harbour Bridge for New Zealand's only bridge climb. The best views of Auckland are seen from the water. Catch a ferry to Rangitoto Island and hike to the summit for an incredible 360° panorama of the Hauraki Gulf and city. Or take a 12-minute ferry ride across to the historic seaside village of Devonport, then walk to the top of Mt Victoria or North Head - two of Auckland's extinct volcanic cones. Auckland has a thriving arts community and numerous galleries to explore, whether you're browsing or buying. Enjoy the blending of contemporary and heritage architecture at Auckland Art Gallery Toi o Tāmaki, or discover the largest collection of collection of Māori taonga at Auckland Museum. Fly from Auckland to Rotorua. Welcome to Rotorua, New Zealand's coolest hot spot. This friendly city sits at the heart of the North Island's volcanic zone, so you can look forward to boiling mud, geysers and steaming craters. Rotorua is also home to NZ's globally unique Māori culture, which you can experience as traditional and contemporary attractions. With so many tours on offer, it's easy to get around without a car. 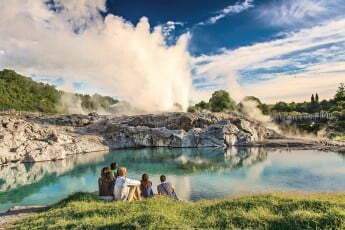 Explore one of the Rotorua's amazing geothermal areas. You can even combine the adventure with a Māori cultural experience, including delicious hangi (earth oven) food, singing, dancing and haka. A great example is Te Puia, located close to the town centre, which includes the New Zealand Māori Arts and Crafts Institute, a kiwi bird enclosure and Pohutu, the largest active geyser in the southern hemisphere. For family fun, Rotorua has an exciting range of animal-based activities to discover, including Agrodome, Paradise Valley, Rainbow Springs and Wingspan. Afterwards, head up the Skyline Gondola for impressive views, lunch at the Stratosfare restaurant and downhill racing on the luge track. For a different kind of adventure, fly through the forest on a zipline on a Rotorua Canopy tour, go mountain biking through giant redwood trees or try rolling downhill inside a giant inflatable ball (zorbing). When it's time to recover, relax at Polynesian Spa in one of 26 mineral hot pools. 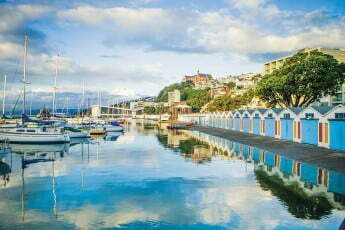 A short flight from Rotorua, you'll find New Zealand's cool little capital – Wellington. This compact and characterful city is packed with cultural activities, one-of-a-kind shops and creative eateries. Did you know that Wellington has more restaurants and cafes per capita than New York? Taxis and public transport make it easy to get around car-free, or you can simply walk. Begin your day with a delicious coffee and breakfast at one of Cuba Street's zany cafes, then stroll the Wellington Waterfront Walk to Oriental Bay, an inner city, golden-sand beach. Look for the typographical sculptures of the Writers' Walk along the way. Check out Te Papa, New Zealand's national museum. It's a stand-out example of how interactivity and creativity can bring exhibits to life. The treasures and stories of New Zealand's land and people are spread over six floors, so this could be an all-day experience. If you're a Lord of the Rings movie fan, book yourself in for a Weta Studio Tour. Weta Workshop, located an easy bus-ride away in Miramar, is globally-recognised for cinematic design and special effects for award winning movies, including the Lord of the Rings trilogy, King Kong, The Chronicles of Narnia and Avatar. All tours begin at the Weta Cave Shop. Wellington is also a great place for gardens and wildlife. The historic red cable car will take you up to the Botanic Garden, and then a 30-minute walk will find you at Zealandia Ecosanctuary – 255 hectares of protected forest that's home to some of New Zealand's rarest birds, reptiles and insects. Getting to Nelson from Wellington couldn't be easier and the flight is super scenic. Below you'll see what makes this region special – beautiful beaches, the Abel Tasman National Park and vineyard areas connected by biking trails. 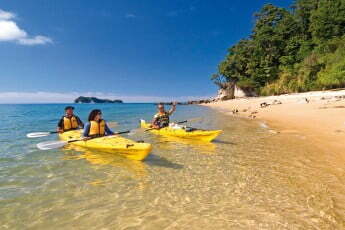 What's more, Nelson is the sunniest region in New Zealand, so there's a good chance you'll get great weather. Nelson is an arty city, so explore the creative and heritage precinct, then take a stroll through Queens Gardens. For a more challenging hike, follow the trail to the Centre of New Zealand monument on Botanical Hill – the views across the city and Tasman Bay are worth every step. Make sure you visit the National World of Wearable Art, a museum where art fits the human form. Think you can't go to Abel Tasman National Park without a car? Think again! There are plenty of local operators to help you access the park, including shuttle buses, water taxis, kayak companies and cruise boats. Once in the park, you can do your own thing or be guided as part of a group. Nelson's wonderful climate helps to produce sensational wine, cider, beer and artisan foods, so get on your bike to discover the Great Taste Trail. You'll bike to craft breweries, cellar doors, food producers and much-loved restaurants. Local bike hire operators are ready to help with maps and tips for a magical day trip. Fly across the Southern Alps and down to Christchurch, the South Island's largest urban centre. This beautiful city has heritage buildings, picturesque parks, cool street art and unexpected adventures, like punting on the River Avon. Christchurch's heritage trams are a fun and easy way to travel around the city's main attractions including the Arts Centre precinct, the Botanic Gardens and colourful New Regent St.
Stroll through Hagley Park and the Botanic Gardens. 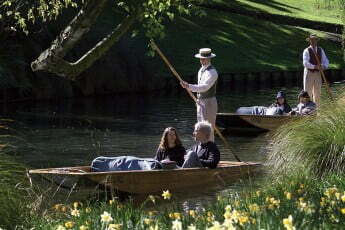 If you'd like to sit back and relax, a skilled punter in traditional Edwardian attire can glide you along the Avon River. Afterwards, head to the new shopping precinct 'The Crossing'. It's easy to hop from one adventure to the next as Christchurch is a very walkable city. Have a cool time at the International Antarctic Centre. You'll journey through modern-day Antarctica, ride on all-terrain Hagglund vehicle, experience a magical simulated 4D Antarctic cruise and hang out with little blue penguins. For a day trip that's huge on scenery and comfort, enjoy a scenic rail journey on the Tranz Alpine train from Christchurch to Arthurs Pass National Park, located high up in the Southern Alps. The viaducts and braided rivers are awesome! Touch down in the alpine town of Queenstown, nestled amidst the Southern Alps at the edge of Lake Wakatipu. Most accommodation options are within easy walking distance of the compact downtown area, which has many excellent restaurants. Water-based attractions can be found at the lakefront and there are plenty of local transport options, so you can feel comfortable about getting around without a rental car. Soak up the astounding mountain and canyon views at Onsen Hot Pools, rent a bike and follow one of Queenstown's wonderful bike trails or find a lakeside restaurant for an unforgettable meal with wine matched to every course. Enjoy an iconic Queenstown experience and catch the gondola up Bob's Peak, to the Skyline complex. From the top you'll enjoy panoramic views of the town, Remarkables Range and Lake Wakatipu. There are various activities up here, including a luge track and haka performances. Take a day trip to Milford Sound, a fiord once described by Rudyard Kipling as the 'eighth natural wonder of the world'. Catch a boat cruise or hire a kayak to appreciate the magical blue skies, forested mountains and tumbling waterfalls. For top-level excitement, take to the skies with a flightseeing trip over Fiordland. Catch a flight back to Auckland, and then connect on to your international flight home.